At the entrance of the kitchen, there is a welcoming Butler’s Pantry with floating shelves for all your nicknacks. The Island is Silestone Quartz in White North with two Waterfall Ends. Darker perimeter countertops in Silestone Quartz Calypso is a great contrast to the a light colored Island focal point. Cabinetry: Mouser Cabinetry with Avalon Door Style and Slab Drawers in White Finish. Decorative Hardware: Top Knobs Polished Square Bar Pulls. 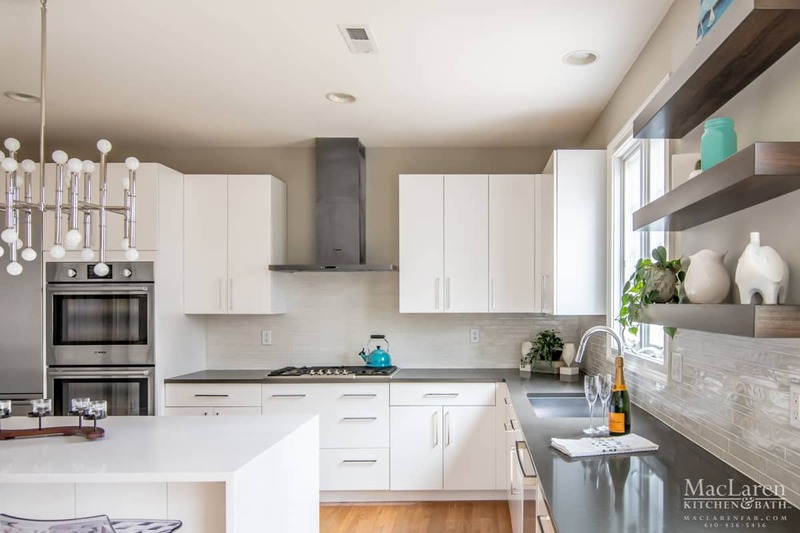 Countertops: The Perimeter countertop is Silestone Quartz Calypso and the Island is in Silestone Quartz White North. Sink: Luxart LXZS771, the faucet is a Luxart Aerro a137-cp. Customer Remarks: “Thank you Michele! We had a wonderful experience working with you and MacLaren Fabrications on our Kitchen Remodeling Project 2016. We interviewed 3 other companies and felt that you were the only one who understood what we wanted. You immediately understood my style and jumped right in with your ideas and enormous enthusiasm. You were quick to think outside the box, for example, coordinating custom-made floating shelves that were exactly what we wanted. It was truly a pleasure working with you. You always made me feel that our project was important to you.. and that you really enjoyed working on it with us! 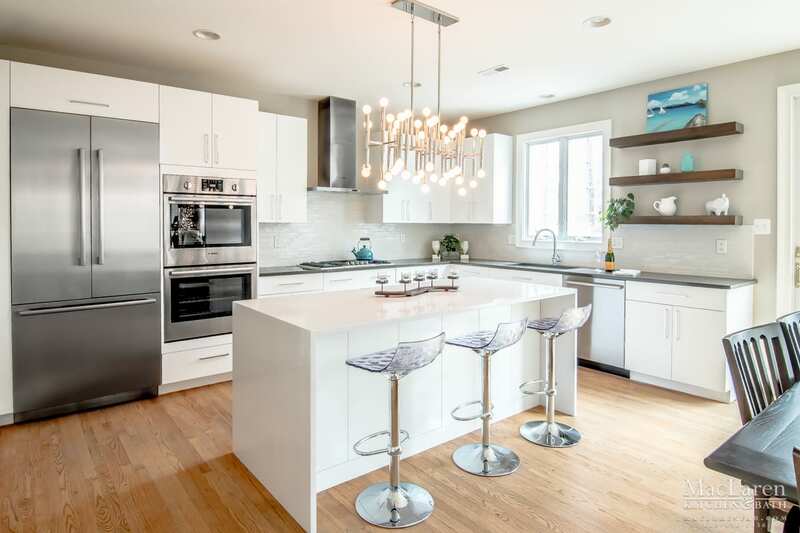 This smooth modern designer kitchen in West Chester, PA was designed by Michele Hennessey. What we love about this kitchen is that it has a sleek, modern look without feeling cold. Check out how we created it below! The entrance to this kitchen boasts a modern take on the classic – sleek natural custom floating shelves in a large, inviting butler’s pantry. The pantry’s floating shelves are perfect for displaying anything from a spice rack to pieces of value to fun knickknacks. The minimalist design of the shelves will make sure to stay subtle and really showcase whatever you put on them! 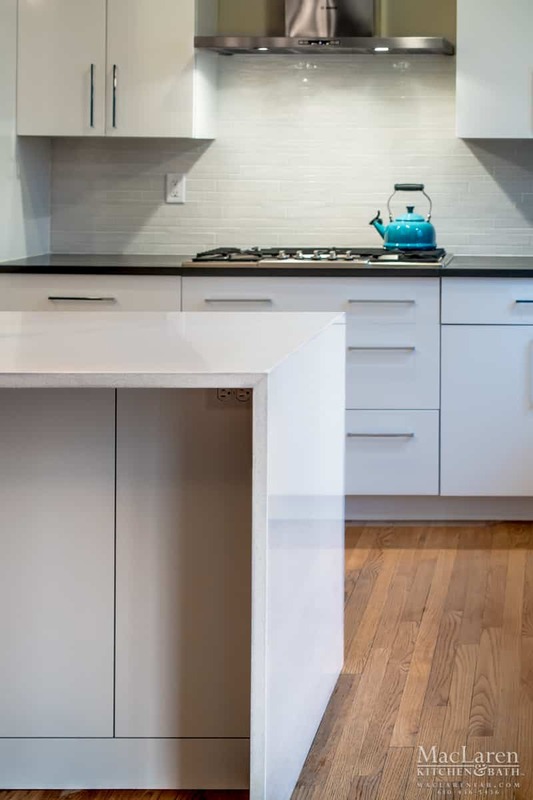 The waterfall edge on the beautiful white north silestone quartz island is a stunning touch that feels functional and intentional, and the mod seating adds a chic touch and color contrast to the white island. It’s a pared-down look that still has personality. This is an island for entertaining! Whereas most of the shapes in this kitchen are angular and sharp, the pendant lighting creates some contrast above the island and softens the space with its flowing shape and rounded bulbs. 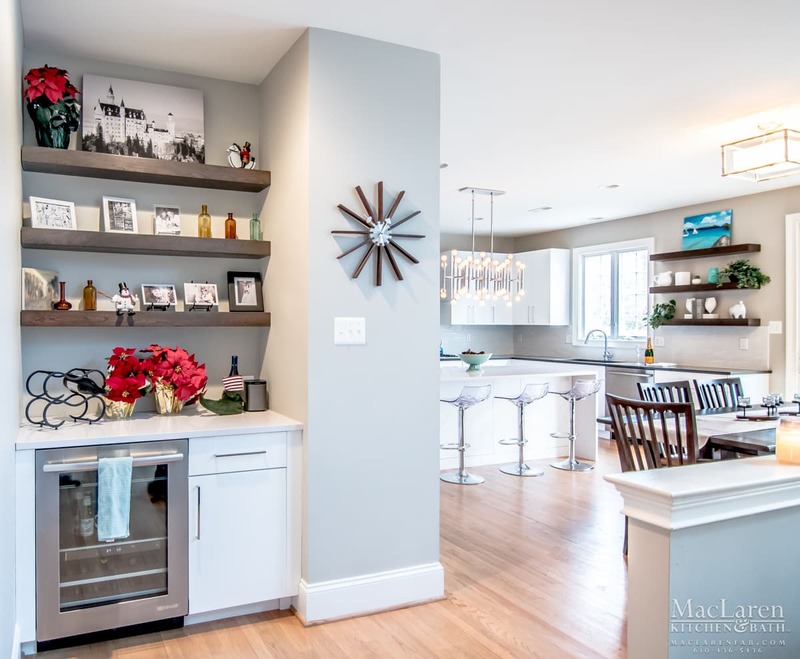 The bars in the lights also bring together the lines of the floating shelves, the cabinet handles, and the island seating for some fun play on shapes. This kitchen isn’t just about looks! Some kitchen perks include an in-island warming drawer, a convenient oven, an in-pantry mini fridge, more floating shelves, and ample cabinet and drawer storage. This kitchen looks cool while providing all the functionality a kitchen should have and more! The darker calypso silestone quartz countertops around the perimeter of the kitchen serve as a contrast to the white countertop of the island and brings out the colors of the appliances and range as accents. If you’re not a fan of color, you can play with different shades in one color, or pops of color in accents or what you choose to display, such as art or plants. No modern designer kitchen is complete without modern designer fixtures! 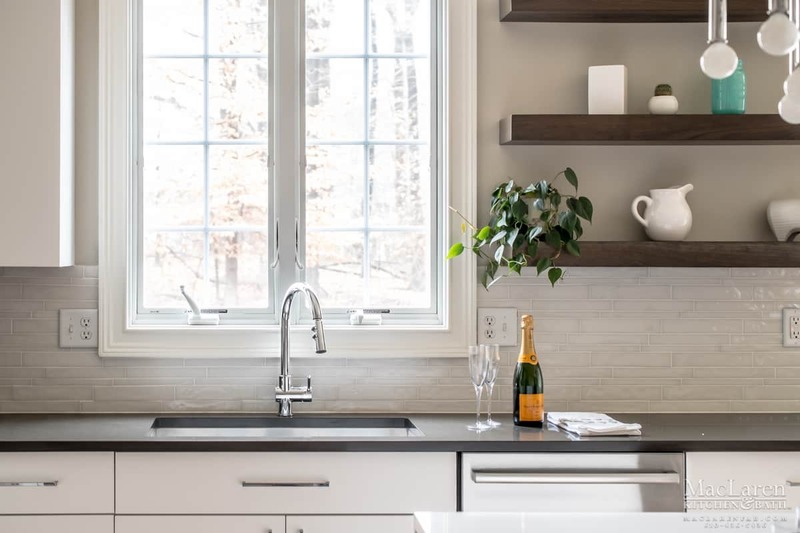 This kitchen has a Luxart LXZS771 sink and Luxart Aerro faucet that complete the modern aesthetic. 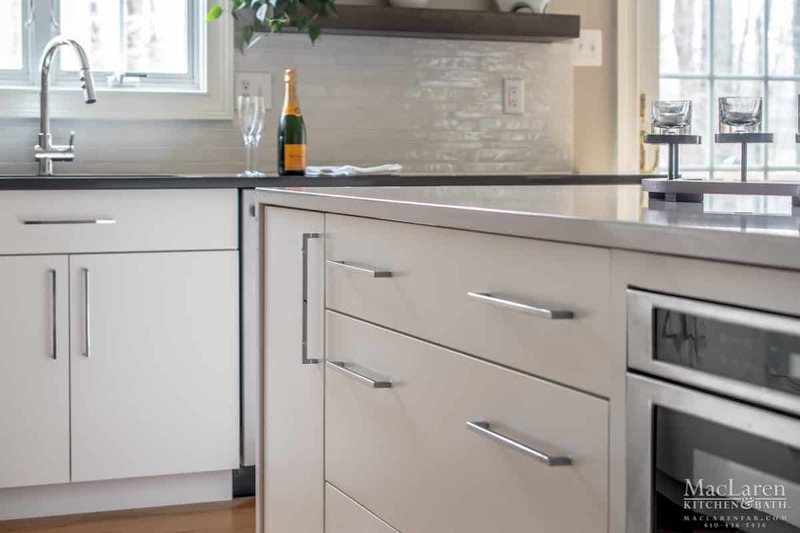 The bright Mouser cabinets have an Avalon door style and slab drawers in white, with polished top knob square bar pulls that bring that modern feeling to the cabinets. Incorporating little details like these into the kitchen’s style makes all the difference. 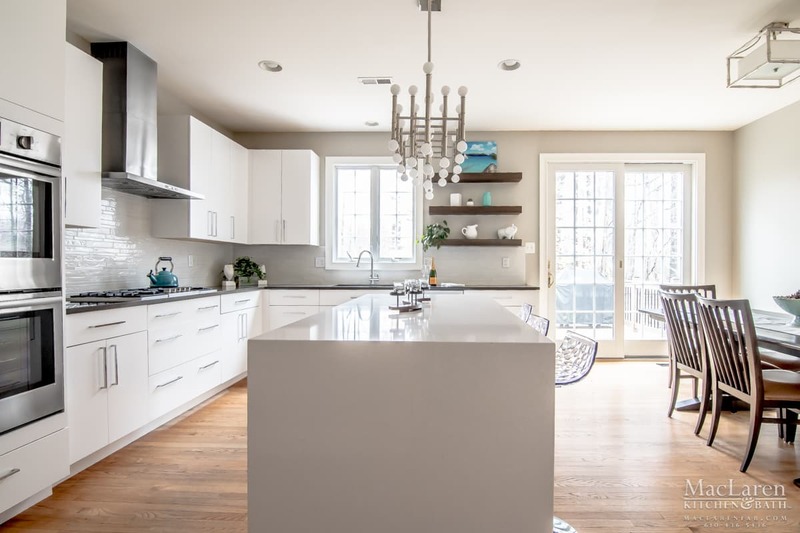 Client satisfaction is our top priority at MacLaren Kitchen and Bath, and we’ll do what it takes to match your style – whether modern, country, or something new – and give you your dream kitchen. 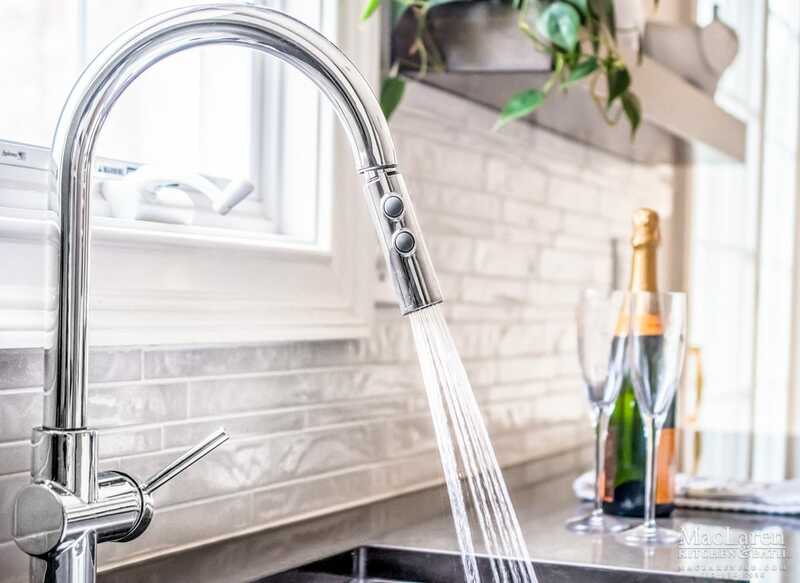 From our complimentary consultation process to sketching up designs, ordering materials, and installing your kitchen, we make sure you’re a part of every step of the process. So bring your vision to our West Chester, PA showroom to get ideas and browse materials, or give us a call at 610-436-5436 today to get the kitchen remodeling process started with a free quote from us!